First order of bidness. It has been decided. 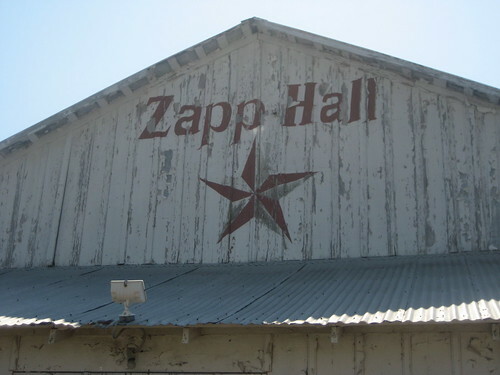 I will be back in Warrenton, at Zapp Hall for the Spring Show. Yee haw! The Fall Show was so much fun! So, go ahead and pencil me in. March 27 - April 3. Heck. Use ink. You know you wanna! I'll be at the same location, between Zapp Hall and Royer's. Just look for the tent with the knotted sheers. Be prepared. Bring a large trailer. I have doubled my space! Next order of business. With the cooler weather and the holidays approaching, egg nog comes to mind, yes? Yesterday, I stopped by my local liquor store, and lo and behold, what did they just get in? 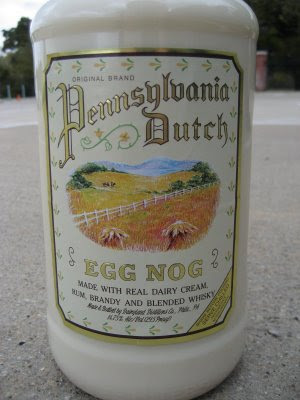 Pennsylvania Dutch Egg Nog. Don't ask me how many cases I bought. Yes. Cases. I praised it last year, and I continue to brag on this amazing liquid gift to mankind. In this bottle of beauty, you will taste blended whisky, rum, and brandy in fresh dairy cream. Get out your fat pants and plant your booty at home, cuz, there's no need to be out and about drinking this unless you have a designated driver. Pennsylvania Dutch Egg Nog puts the Zing in amazing! Next on my list of things to talk about. Debbie scared me today with a BOO! According to Debbie, Tina at The Tattered Cottage is having a You've Been Boo'd Party. You Have Been BOO'd The air is cool, the season is fall,Soon Halloween will come to all. Ghosts and goblins, spooks galore...Tricky witches at your door. 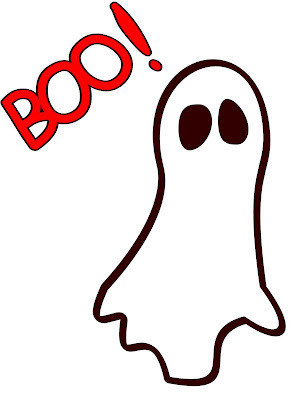 The spooks are after things to do,In fact, a spook brought this "BOO" to you. The excitement comes when friends like you,Copy this note and make it two. We'll all have smiles on our faces,When we see who Boo'd who's places. Listen here. I am not always a rules follower with tags and all. But, this one is cute. And I just love Debbie for playing with me. So, I am supposed to BOO 4 other bloggers and they are supposed to BOO 4 others and so on. If you are inclined to play, do so. If not, no Boo Hooing here. (aren't I funny?) I am going to BOO some bloggers who came by and visited with me at Zapp. Y'all have fun! And if you choose to play, head to Tina's blog and add your link to Mr. Linky. Anne at Fiona and Twig...BOO! Angelique at Six in One Hand...BOO! Adrienne at The Flying Bee...BOO! What an odd coincidence that everyone's name starts with an A. Hmmmm. BOO! I am still holding out for my pumpkin latte because it is still HOT here. I had to go to the pumpkin patch in 80 degree weather today...just not right. So, I will have to pass on the egg nog...but it is not too hot to crack open a bottle of wine..it IS Friday night! Ya know...I still have a bottle in the pantry left from last year...reckon it gets stronger with age? I knew I could count on you to "see" your way to play along! Boo backatcha! I'll have to tell Mr. Twig about the eggnog, he's a big fan of the stuff. I knew you'd be back at Zapp in the Spring! How could you not be? You'll be in the same spot, I'm guessing? No Pennsylvania Dutch EggNog for me this year. Alcohol and chemo don't mix. Boowho! Well, BOO HOO for me, because I have never liked egg nog....and it sounds like I am missing out, but that bottle looks pretty BOO-TI-FUL! Oh, and a big BOO-YA for setting Warrenton in stone. I definitely will pen you in! Can't wait to see you again! Oh, and thank you so much Mindy for your sweet comment on my last post. It meant a lot to me. Boo Blessings!! I never knew there could be so much booing fun! Have a wonderful time!!! And thanks for the eggnog tip ~ I am getting my eyes focused for some beginning.... now! Eggnog is my weakness, but I can't every get anyone else to drink it with me. Oh, well, more for me and more fat too. Glad you'll be at Zapp because I'm coming to the Spring show! Can't wait to mete you and see your goodies! That Egg Nog sounds like my kind of egg nog :) I'm going to have to see if my local grocer carries it. Thanks so much for playing along with the "BOO Party". Your BOO ghost is cute :) I'm off to visit your blog for a little while. Many thanks for visiting my blog. I love the little Boo ghost. Me thinks I need so snag me some of that eggnog. Sounds yummmmm! What a fun blog. 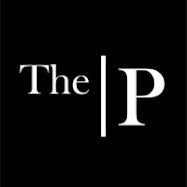 I am joining as a follower and hope you will come for a visit and do the same.